Earlier today, as I was about half way through my daily compulsive tech industry web site visits (a daily frenzy driven by subclinical O.C.D. ), I was hit in the face with an anorexic soccer mom exploding into an epileptic seizure kaleidoscope, courtesy of Intel. I am left to guess it to be either an insipid rip-off of Michel Gondry’s masterpiece “Let Forever Be” or some sort of a video tribute to Satan. Sadly, this is not the worst part of the campaign. 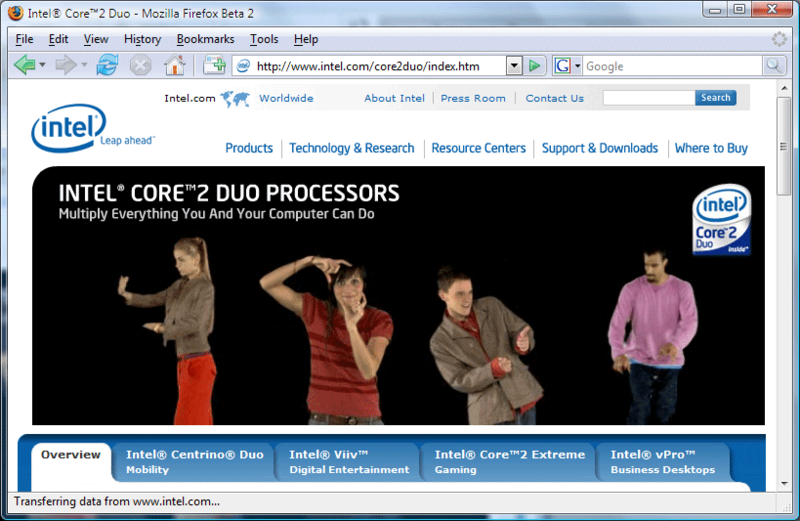 The newly-designed product page for Intel Core 2 Duo sports a puzzle where visitors are asked to figure out which retarded mime represents which Intel product or “product” (I am talking about you Intel Viiv). Someone’s going to hell for this. This entry was posted in crap, insane, media, wtf. Bookmark the permalink.